« MtG: Preparing for my first ever EDH / Commander Tournament! Dear friends and fans of Elemental Clash! 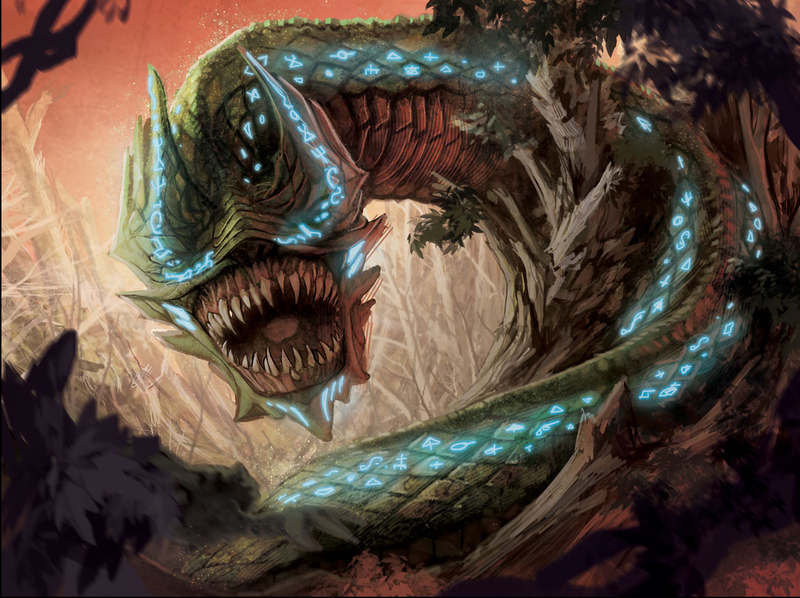 For those who are not familiar with the card: It is a 3/4 Creature costing 3 Earth with the quite awesome Destroy-Effect of putting as many cards as Venus Wurm had DEF from the top of your Archive (dicard) under your Spellbook (deck) in any order. Then I assigned the artwork to a new artist whom I had found on Deviantart.com. 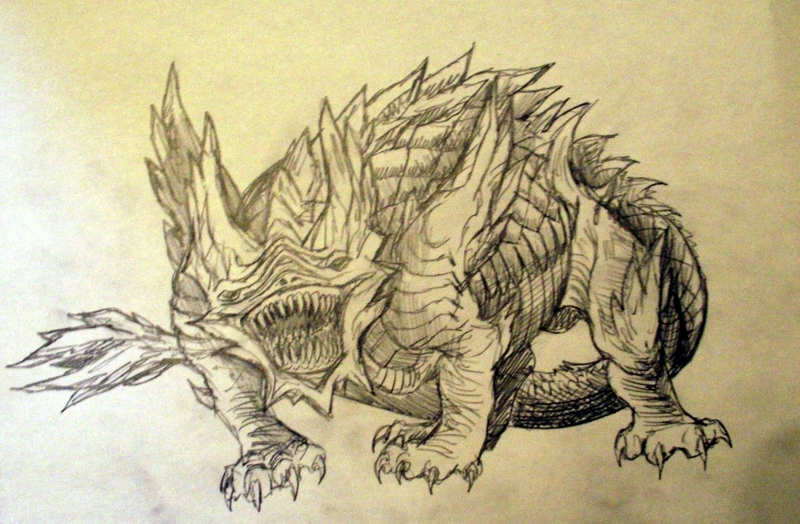 He was quite amazed about my sketch and started to paint the above Creature which I called Venus Dragon, as it is obvioulsy the draconian cousin of Venus Wurm. Well doesn’t this look amazing? I for one love it and I am really looking forward to seeing more of Rubéns great works! As you can see, Venus Dragon is similar to Venus Wurm but also very different, the major difference being that you need to “Tribute” Creatures to him when you play him so he gets stronger or even extremely strong. You may summon him without Tributing any Creature but that would make him a lowly 0/2 Creature for 3 Energy. 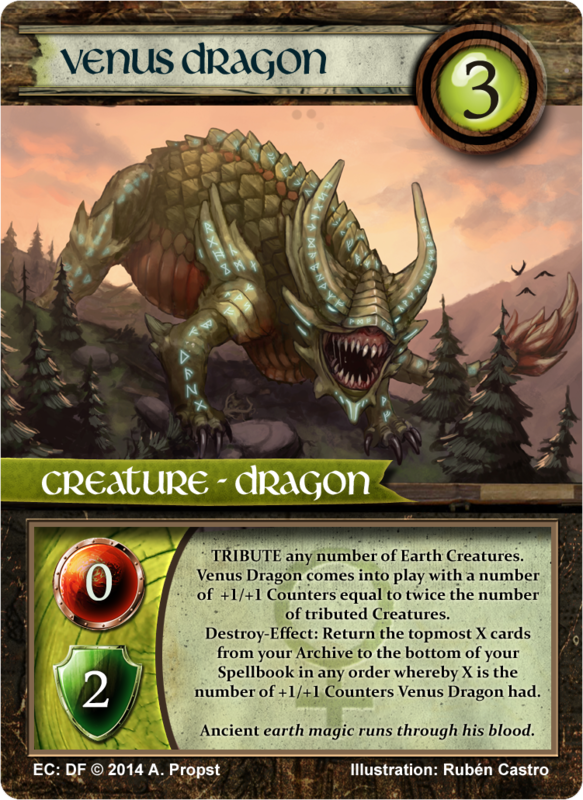 However as you can read for yourself, the more Earth Creatures you feed to him, the more +1/+1 Counters he will enter play with and the more cards he will return from your Archive to your Spellbook in case he is destroyed. For example if you Tribute two Earth Creatures he will be a 4/6 that will restock your Archive with 4 cards when he dies (unless he is purged, as Destroy-Effects only trigger when the Creature goes to the Archive from play). In theory, you could sack all your Earth Creatures to Venus Dragon, but I would recommend being cautious with Tributing, since one Creature is easier to get rid off than several Creatures. So it is really a high-risk/high-reward kind of deal. 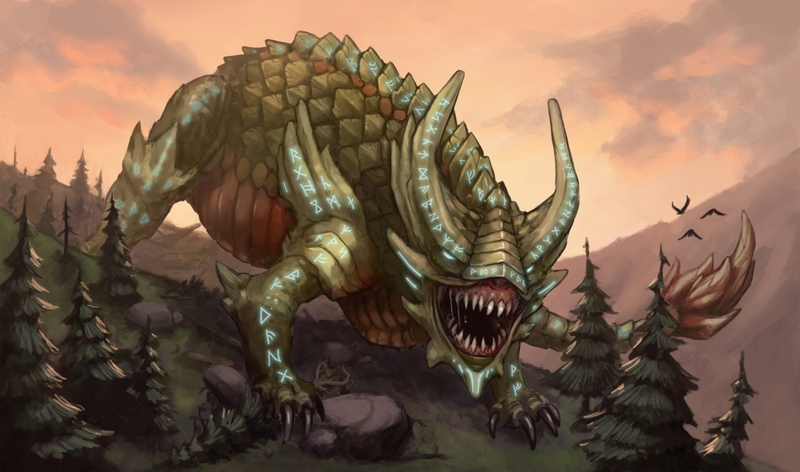 Good “Tribute Fodder” for Venus Dragon (from the Master Set) would be for example Restless Corpse, which cost 1 Earth and respawns from your Graveyard when destroyed or Loam Shaman, another 1 Earth Creature that has the Destroy-Effect of returning two cards from your Archive to the bottom of your Spellbook. More great interactions with this awesome card are possible and will grow in number as new cards are being released. One thing I’d have to note: Powerstone would go extremely well with this one! Well I hope you liked this new Dragonforce card preview and again a very warm welcome to Rubén from Chile! This Post was posted in Elemental Clash, News. Bookmark the permalink.